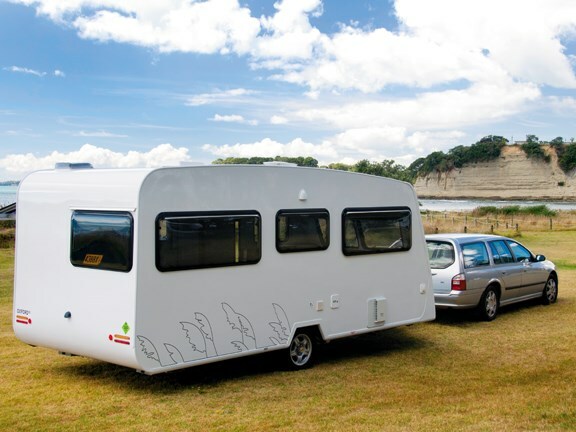 When I read the brochure for the Oxford caravan to be reviewed, it struck a chord as there is reference to the part Oxford caravans of yesteryear played in those summers romantically remembered - "Something of a Kiwi legend…memories of idyllic Kiwi summers parked beside white-sand beaches…turquoise bays…friends and families..."
At first glance, the new Oxford 55 is a far cry from last century's model. Fibreglass cladding replaces aluminium sheet; gone too is the heavyweight, galvanised-steel channel chassis and in its place a lightweight, galvanised pressed-steel chassis from the international manufacturer Alko, which supply the wheels and axles. Alko is the first choice of a large number of offshore manufacturers attracted by its emphasis on reduced weight and improved safety systems. These weight savings are reflected in the overall weight of the Oxford, the tare weight coming in at 1406kg and the GVW at 1650kg, allowing it to be towed by a range of four-cylinder family cars with 1.8 to 2.4-litre motors. The Oxford 55 is as good-looking as its predecessor, with the same air of solidity. 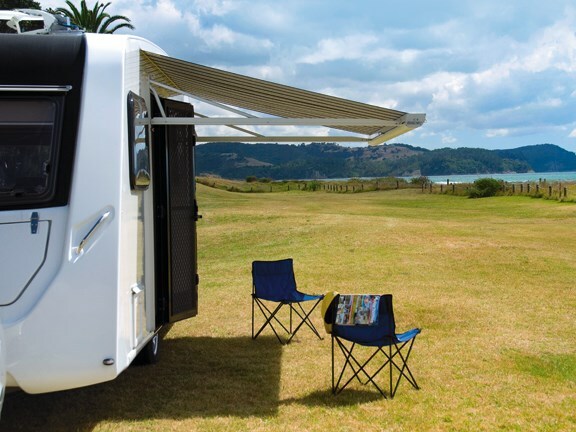 In common with its larger sibling, the Oxford 65, the fibreglass panels are well engineered, with careful attention to detail where the front panel overlaps the sidewalls, and where the roof and wall panels join. These seams are unlikely to allow water to penetrate through to the foam insulation in the walls. I like the fact the roof panel is a continuous length of fibreglass sheet, starting below the front windows and curving over the roof and down to form the rear panel of the caravan. It minimises the number of joints in the sheet, reducing the chance of leaks. The wall panels are aluminium-framed sandwich construction, with an outer skin of fibreglass and an inner skin of pre-finished ply vacuum, bonded together to contain the foam insulation. Combined, these features should ensure trouble free service in the years ahead. There is a cover over the chassis between the tow hitch and the body. However, it is clearly marked 'no step' which defeats the purpose a bit because it is a tempting place to stand to wipe clean the front of the caravan. Aside from that, the tow hitch is standard 'Kiwi' rather than the Alko stabiliser hitch that would have matched the Alko chassis. This is a pity, as I think it would have helped remedy a problem I had towing the Oxford, possibly due to the towing vehicle supplied - a Ford Falcon AU station wagon circa 2002 - which had the Oxford appearing as slightly nose heavy. This might have been rectified if it had it been a larger 4WD. However, subsequent discussions with the team at Motek have led to an offer to throw in an Alko stabiliser. The Oxford 55 has an open-plan layout with the permanent double bed alongside the bathroom at the rear, the U-shaped lounge at the front with the kitchen amidships opposite the access door. This open-plan layout makes the Oxford 55 feel very spacious. The predominantly white interior décor enhances this impression of openness. The style is minimalist retro with warm, honey-toned timber facings relieving the blandness to some extent. The upside is it provides opportunity for owners to introduce their own colours to personalise the interior. 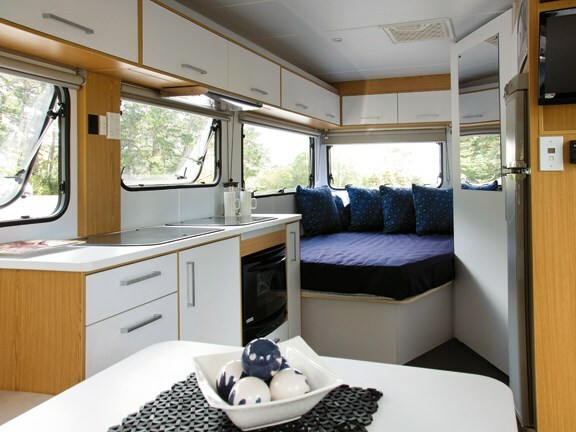 The kitchen is well equipped with a large three-way 175 litre Dometic fridge/freezer, microwave oven, three-hob gas cooktop with rangehood above and an oven below, and a sensibly-sized sink with a built-in dish drainer. It is a workable kitchen with a generously proportioned benchtop and adequate cupboard storage for food and beverages. All in all, a very practical kitchen. The practical nature of the bathroom is a real positive. The stylish rectangular handbasin sits on a two-door cabinet and is fed by an elegantly-curved, bench-mounted faucet. Alongside is a ceramic-bowled Dometic CT3000 toilet, comfortably positioned to accommodate XXL-sized people. Behind a domestic-size sliding shower door is a domestic-size (800mm x 900mm) shower stall, again suitable for persons of XXL stature. Like the Oxford 65, the 55 has an intricately moulded shower base designed to allow water drainage past the teak floor grate. There are two mirrors, one on the outside of the bathroom door, the other on the wall above the handbasin. For my money, it has everything an RV bathroom needs: quality fittings, lots of space and a door that isolates the rest of the caravan from the less pleasant activities that occur in bathrooms. Strangely, there is no blind or curtain on the bathroom window, so you might need to become accomplished at doing Salome's dance of the seven veils to maintain your modesty. The main bed at the rear of the van is comfortable but lacks convenient shelves or cubby holes for personal stuff, books, a cup of tea and things like that. Like the kitchen, it is practical, if not comforting. 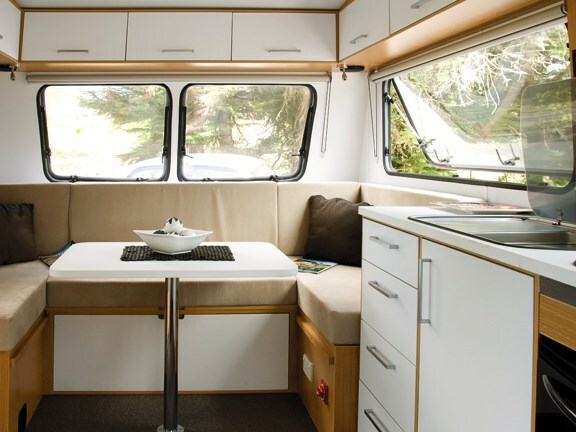 The dinette/lounge at the front of the van seats four easily and the dining table that stands on a centre pedestal is easily removed. Pull out the sliding base, rearrange the cushions and the dinette quickly converts into a second double bed. Under the dinette seat on the off-side side of the caravan you will find the gas water heater, the house battery, the battery charger and monitor, and the 240-volt switchboard. Under the kerbside dinette seat is the Propex gas heater. Storage is adequate for a caravan of this size. The front outside storage locker houses the two four-kilogram LPG bottles and the spare wheel with room to spare for folding chairs and tables. A locker hatch alongside the entry door accesses an almost full-width locker under the rear dinette seat. There are overhead lockers to burn, with lots of room for crockery, food, clothes and personal items. There's a full-length wardrobe alongside the fridge and large storage space accessed below the double bed by lifting the bed base. It is gas strut assisted. There is no external access to this space. In summary, the new Oxford 55 does bring the Oxford traditions into the 21st century. A great exterior with an interior that has contemporary component parts practically presented. 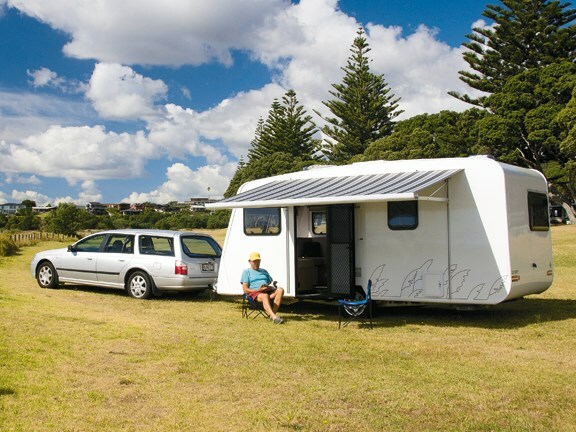 The Oxford 55 is currently available from Motek Sales in Albany from $44990 including the awning. The TV, satellite dish and Propex gas heater are extras. For further information contact the sales team at Albany on 0800 868 488 or visit motekvehicles.com. Feel free to make a comment or ask us a question about this story on the MCD page. For the latest reviews, subscribe to our Motorhomes, Caravans & Destinations magazine here.